In Issue #114 of Singletrack Magazine, Chipps tested, reviewed and recommended the latest SLX groupset from Shimano. While it’s all very nice to play around with chichi components like Shimano’s XTR, or its electronic shifting Di2 groups, the majority of the world is more likely to be riding around on regular groupsets, like Shimano’s more down to earth SLX and Deore groups. After its last outing in 2013, the SLX groupset was due a redesign and it was no surprise to see the fresh SLX M7000 groupset take many influences from XT and XTR. The biggest changes were probably in the slimming down of the brakes and the increase of gear ratios. 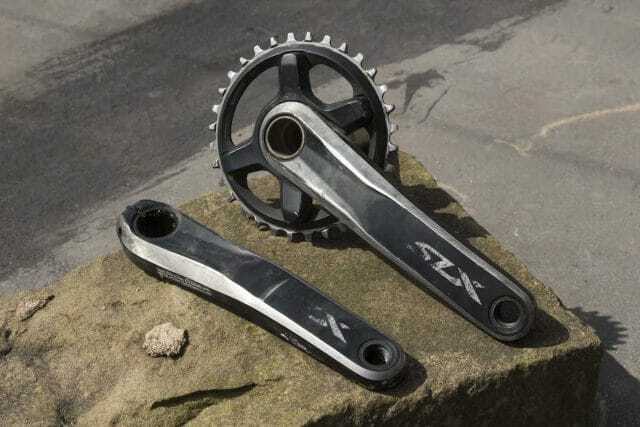 SLX went 11-speed, while also heralding in wider 11–40T, 11–42T and, recently 11–46T cassettes to give a greater range of gears, whether running it 1×11 or 2×11 (there’s even a 3×10, though we doubt we’ll see many of those in the UK). 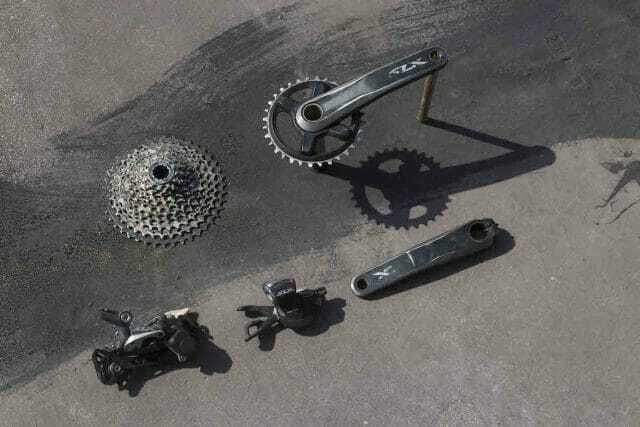 While XT components are often comparable to XTR, with SLX there are more material changes to keep the price affordable. Where XT might use alloy shifter paddles (and XTR alloy and carbon), the SLX paddles are plastic coated steel. Sometimes finishing touches are omitted, again to keep costs down: SLX brake levers are alloy, like XT, but lack the little textured dimples that add a tiny bit of grip and feel to the levers. Many riders, though, are happy to skip these little touches and accept a little more overall weight in return for affordability. The M7000 SLX brakes have been updated too. Starting at the brakes, the SLX brakes have the new, much slimmed down design, trickled down from XTR, with a small oil reservoir, slim clamp and svelteness that brings a single front brake, hose and caliper in at 263g without skimping on power or performance. There’s still a tool-free reach adjuster (though you lose the bite-point adjustment from XT and XTR). The brakes ship with stock resin pads, but the design is shared through the range, so upgrading to finned metallic pads, as we have, is easily done. The SLX shifter borrows Dynasys shift technology from XT and XTR. 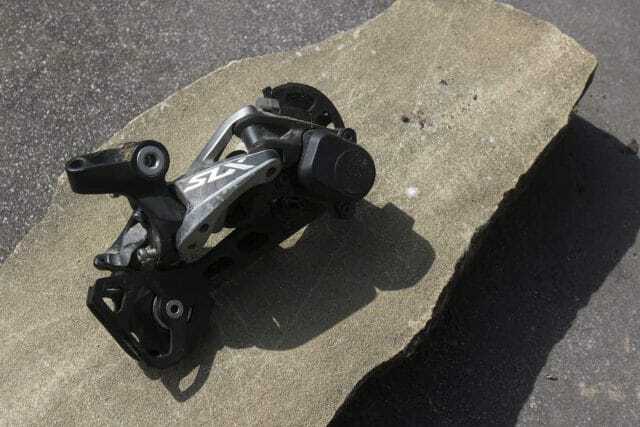 The SLX shifters have the ‘Dynasys’ shifting that is common throughout the range and shifts are accurate and smooth, though fairly stiff and far from the efficient ‘snick’ of XTR. There’s a lot of free-throw on both the thumb and finger trigger before you start moving cable. And while the two-way finger trigger remains it does lack the double-upshift that XT has, which racers will definitely miss. We went with the 1×11 option, though 2x and even 3x setups are also available. Perhaps strangely, there isn’t an SLX bottom bracket. You can spin on either XT (£34.99) or Deore (£16.99) so the choice is yours. The SLX chainset is a smart affair. Slab-sided forged aluminium has kept tidy enough through the test and, despite the logo almost instantly wearing, I reckon the crank looks better than a similarly used XTR chainset, whose high-polish finish quickly shows every heel scuff and rock scratch. 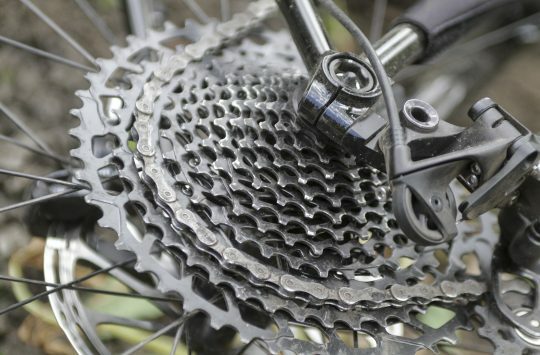 Shimano still doesn’t make a dedicated trail 1x chainset, so even with this single ring setup, with Shimano’s forged DCE (Dynamic Chain Engagement) chainring, the crank still has threads for a ghost inner chainring. Talking of chainrings, the chainring is a composite-reinforced forged steel job, coming in 30T, 32T or 34T. 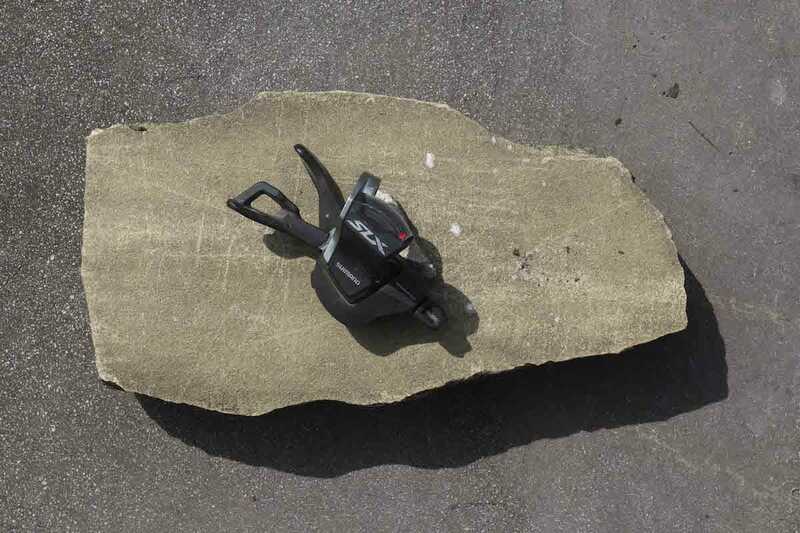 Shimano’s offset four-bolt system means you’re limited in terms of aftermarket rings – and, perhaps more importantly, a 30T ring is the smallest you can run. Something that 29er riders or those with a lot of climbing to do might not like. As mentioned, our SLX came set up 1×11, so we’ve not had a chance to try any of the 16 different front derailleur options. Shimano does make great front mechs, though, if you like that kind of thing. The Shadow Plus mech is nicely low profile and has an adjustable friction clutch for chain management. Finally, out back we have the SLX GS Long Cage 11-speed rear mech, playing over a matching 11-speed cassette. The cassette is mostly a collection of individual full steel sprockets, rather than the spider-mounted clusters of XT, with only the largest three sprockets mounted on a composite carrier to reduce weight. The largest sprocket is aluminium, again to cut down on weight. 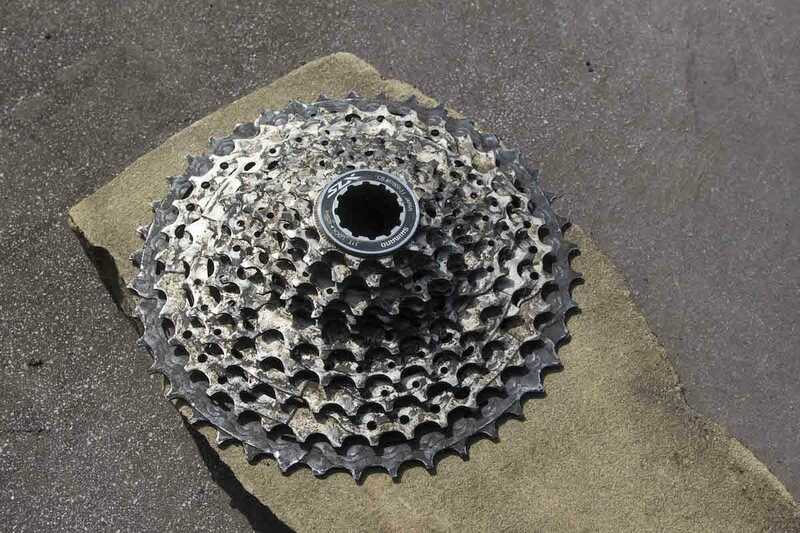 The 11–42T cassette weighs in at 481g, not a huge penalty over the XT model. Shimano offers the SLX cassette in 11-40t, 11-42t and 11-46t ratios. So how does it ride? The groupset in general is extremely competent to the point of dullness. Everything works as expected and I couldn’t find anything really to complain about. It’s a little heavier than XT, but it’s a little cheaper too. Braking, especially after fitting upgraded pads, is great. Firm and predictable, with instant hands-free adjustment of reach. 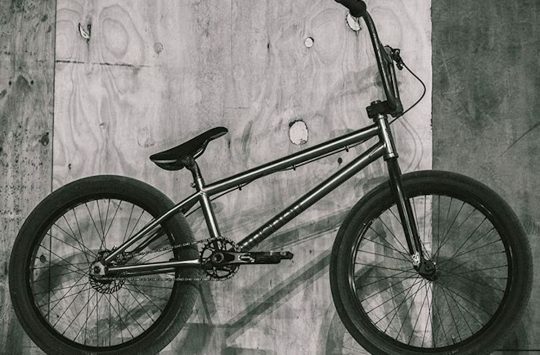 The look, too, is small and neat enough to complement any bike. 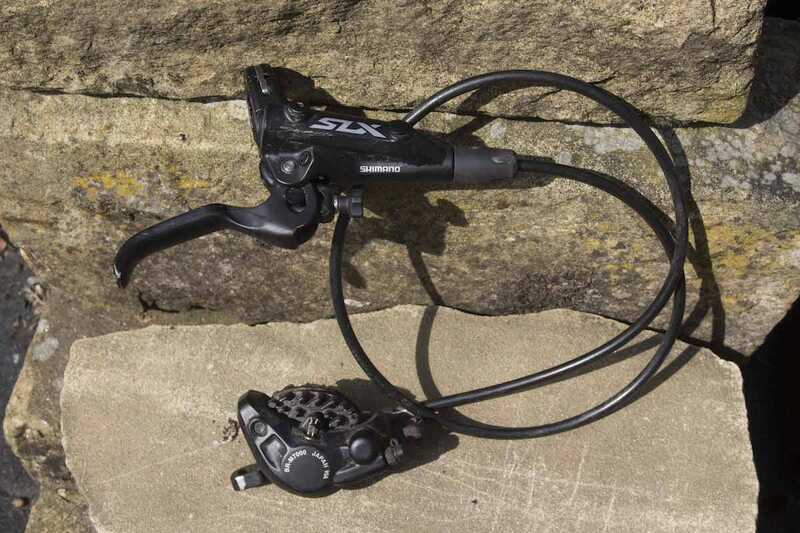 Solid, workhorse stuff – Shimano’s SLX groupset comes recommended. I didn’t miss having a brake bite-point adjuster, but the free play on the shift lever did annoy me, especially when swapping from a bike with SRAM’s ballpoint pen-clickiness to its shifting. 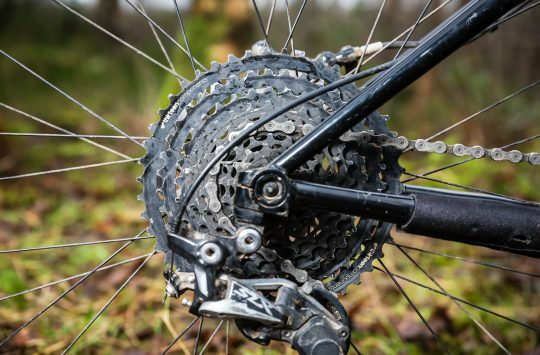 And while we’re comparing, Shimano’s 11–46T cassette is still left wanting compared to SRAM’s 10–50T GX Eagle, or even Sun Race’s 11–50T for single ringers. If you’re a double chainring advocate, then that’s not an issue and Shimano’s ranges are great for 2×11. I can’t help but think that front derailleurs will go the way of quill stems sooner rather than later though. Smooth shifting, firm braking and good, lasting looks from SLX. I’d be quite happy running this on any of my bikes, regardless of price, though I might upgrade to an XT shifter in time. Though, when are they going to get properly on the one-by boat, eh? SLX cranks are the same weight as XT, if not actually a little bit lighter !